Mother of Pearl is the iridescent layer of material which forms the shell lining of many molluscs, especially pearl oysters and abalone. This shell lining is also what gives the pearls their coating. 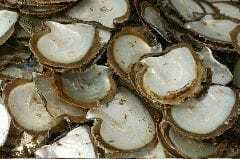 Mother of Pearl shell is used in a variety of products including jewellery, furniture, and musical instruments. Mother of Pearl comes in several natural colours. Clipper Pearls have bulk, silver and gold lipped raw Mother of Pearl shells (Pinctada maxima) for sale. The shells range from Extra Small, Small, Medium, Large and Low Grade, which vary in weight and thickness. To purchase wholesale bulk shell you will need to submit an expression of interest, please email us. Individual shell is also available for sale direct to the public from our office at 41 Herbert St Broome, we do not provide postal services. We have original used panels and shell in its unprocessed form for sale. 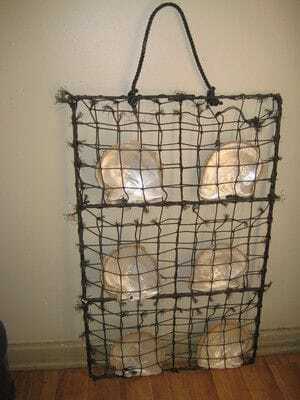 These are rope panels that were used on the farm before they were replaced by the new more durable version. The panels have pockets and come in small to large sizes. Panels are available for sale from our office at 41 Herbert St Broome WA. If you would like any further information about our panels, please email us.